"The London Gold Pool was the pooling of gold reserves by a group of eight central banks in the United States and seven European countries that agreed on 1 November 1961 to cooperate in maintaining the Bretton Woods System of fixed-rate convertible currencies and defending a gold price of US$35 per troy ounce by interventions in the London gold market. The central banks coordinated concerted methods of gold sales to balance spikes in the market price of gold as determined by the London morning gold fixing while buying gold on price weaknesses. The United States provided 50% of the required gold supply for sale. The price controls were successful for six years until the system became no longer workable. The pegged price of gold was too low and runs on gold, the British pound, and the US dollar occurred and France decided to withdraw from the pool. The London Gold Pool collapsed in March 1968. The London Gold Pool controls were followed with an effort to suppress the gold price with a two-tier system of official exchange and open market transactions, but this gold window collapsed in 1971 with the Nixon Shock, and resulted in the onset of the gold bull market which saw the price of gold appreciate rapidly to US$850 in 1980." 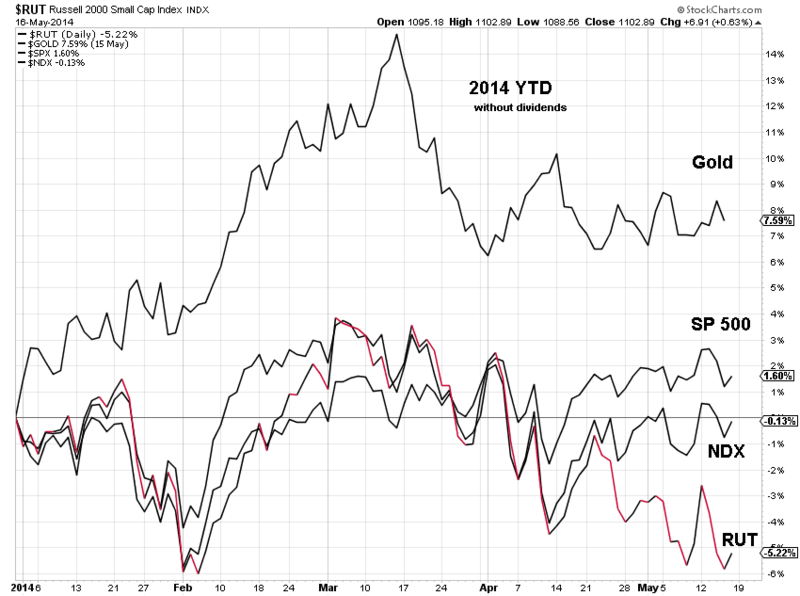 The first chart below this evening compares the year to date performance of the SP 500, the NDX, the Russell 2000, and Gold. If you have not noticed, gold and silver have been 'pegged' just below 1300 and 20 respectively. Someone asked me 'why these particular levels' the other day. I would hope the reason why they are capping the metals in the first place would be fairly self explanatory by now. Who are 'they?' Some of the Western central banks have obviously formed a 'gold pool' through which they are attempting to manage the relationships of a number of currencies and economic factors affecting global trade, including the natural money of gold and silver. This is not my opinion. Central Banks hold gold in their reserves, despite what some monetary theorists might otherwise say. The Banks understand the long history of money, in its ebb and flow. As you may recall, Phase I of the current Gold Pool ended with the collapse of the Washington Agreement, which was an attempt to prop up a failing arrangement often called Bretton Woods II. This failure became unmistakable with the change in the central bank behavior towards gold, from net sellers to net buyers, with the revolt of the BRICs. We are in Phase II now, which is a loose confederation of Western banks being led by the Fed and the Bank of England who are attempting to maintain the status quo and US Dollar hegemony. But the Western banks are running a bit of a failing game with the Dollar, as it has already lasted well beyond its prime. You really cannot base global transactions for real goods on a piece of paper that one country creates at will for its own domestic and foreign policy conveniences. Not unless you are willing to sacrifice your own autonomy. Its a similar to why the euro must eventually fail, because it is a single currency across a non-cohesive political union. It is clear that China and Russia and parts of the Mideast are not on board with the NY London Gold Pool, and India is struggling against its own people. The US is flexing its muscles, but that sort of thing tends to become unsustainably expensive, even for those who own a printing press, but do not own the printing press. The Fed and its crony central banks are in a bit of a panic, and they are attempting to hold the line in the metals, while they try and manage the unfolding set of economic crises which they have created, and which are hardly yet resolved. They have sold out the middle class for their Banks, and now must now sit down to a banquet of consequences, which they are loathe to do. They will throw institution after institution to the wolves before that if they are given the latitude. The Gold Pool would like to strike a lower level, but as we have seen that is a bit problematic, because the vaults of the West were being emptied fairly steadily, and the miners will be having even more trouble staying in business at lower prices. And there remains a stubborn demand for the metals from the peoples of the Mideast and Asia, despite the efforts of the neo-liberals to bring them to heel with colour revolutions and sanctions. I cannot predict exactly when this current cartel will fail, as the London Gold Pool fell when France withdrew for example. It is hard to predict an exogenous decision or shock. But there are no lack of guesses. Guessing is not a practical investment strategy, but it works in selling advice. We will most likely see quite a cat fight amongst Zurich, Frankfurt, Shanghai and London for the next phase of the gold trading market. The foundations for Phase III, in which gold starts to trade more freely, have already been laid. And of course New York may attempt to rule the new gold trade, on the basis that possession is nine-tenths of the law. That ought to go over like a lead balloon with those nations whose sovereign metals are held hostage. "As a reaction to the temporary closure of the London gold market in March 1968 and the resulting instability of the gold markets and the financial systems in general, Swiss banks acted immediately to minimize effects on the Swiss banking system and its currency by establishing a gold trading organization, the Zürich Gold Pool, which helped in establishing Zürich as a major trading location for gold." When did the NY Fed say that they might be inclined to return Germany's gold? That bit of whimsy may provide us with an outer bound for a resolution of phase II of the currency war. Although the Fed is most likely being unrealistic as usual in their forecasting. Perhaps we may see some better hints of it through the fog of deception as the time approaches. But it seems likely that when the new gold pool starts to crumble, the price levels may move with a bit of a bang.